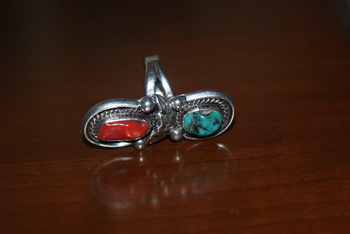 In Fine Jewelry > Native American Jewelry > Show & Tell. This ring is a bit out of my usual comfort zone: It is rather large (a bit over 1 ½ inches) and it is unmarked. It appears to be handmade and is heavy. The ring is not new; there are some signs of use. I am not sure if the ring is made of sterling or nickel silver. I bought it for the craftsmanship. There are no marks on the ring at all. I have looked for similar designs and “old pawn” jewelry kept popping up. I am, however, completely new to this kind of jewelry and would not come to any conclusions because I simply don’t know. Any help would be greatly appreciated. 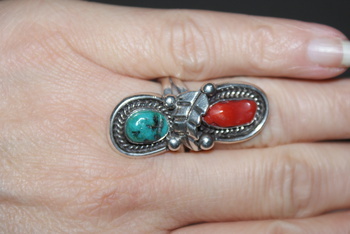 Back in the early 1970's rings of this design were popular with counter-culture folks. 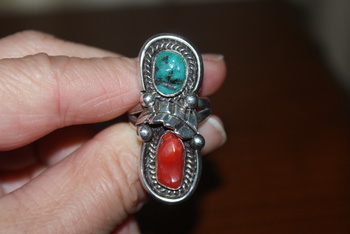 Yes, Navajo sterling silver. 1970's or late 1960's. 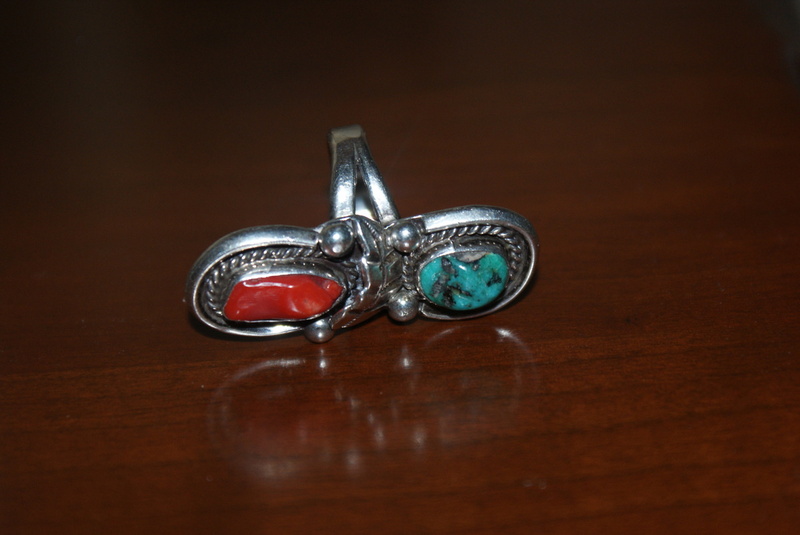 Actually it was Cher that brought a lot of attention to the Native American jewelry back then. Anyway, I did want to let you know that most of the jewelry we see today was made for tourists. That does not mean the value is not there. In fact, when it is NOT hallmarked, usually that means it was not for tourists! The term "old pawn" (dead pawn means the same thing) but it is 'overused' these days. A long time ago when a family needed something to sustain themselves, they used to get a piece of jewelry left to them as an heirloom and 'pawn' it for cash. Many times they could not afford to pay the money to get it back. Hence the term "Old Pawn". Fernpig, you made me laugh - in a good way! I was a bit too young for the Hippy subculture in the sixties but I was not completely immune to the ideas of the counterculture/subculture of the time even though I grew up in East Germany where anything but mainstream was frowned upon and suppressed. Maybe by buying and wearing this ring I am unconsciously trying to re-live youth??? Don’t take me too seriously.